We live in the information age. Scientists at the University of California-San Diego found out that an average person processes 34 GB of data or 105 000 words per day. And the Internet plays an important role in it. According to Hosting Facts, each day more than 3 million blog posts are published on the Net. As a result of such cut-throat competition for users’ attention, publishers are facing a lot of challenges on how to stand out in the information “noise”. Whether it is a small “one-person” blog or such heavyweights as Wired, Business Insider, Bloomberg and even Forbes - all of them are constantly looking for new possibilities to “get noticed” in the crowded marketplace. In the time when publishing moved to a desktop, web push notifications can become an out-of-the-box solution for the above problem. 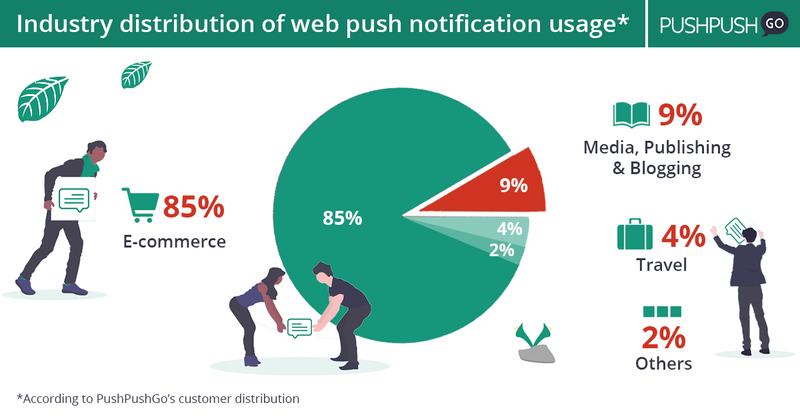 Moreover, data shows that media, bloggers and publishers form the second largest group that uses web push notifications after e-commerce (Source: PushPushGo.com). Send everyday updates about weather, exchange rate etc. Offer downloadable materials such as presentations, eBooks, white papers, checklists etc. So, how to use web push notifications in the publishing industries? Even if a person is signed up for your newsletter, it doesn’t guarantee that he or she will read or even open those emails. Research, made by DMA, shows that 47% of users forget that they actually signed up and 53% claimed they receive too many irrelevant emails. Consequently, 1/5th of consumers have abandoned their email account because of the overwhelming amount of letters they receive. 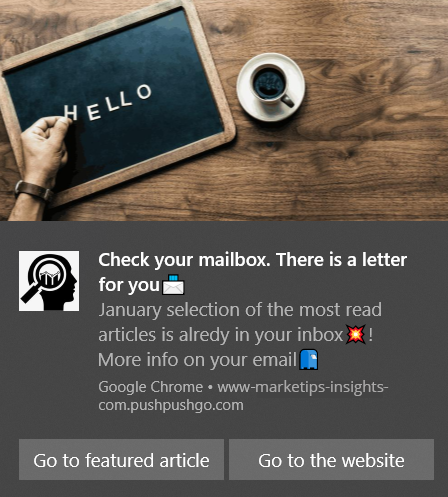 And even though newsletters still remain a powerful tool to reach your audience, web push notifications can perfectly complement and fill in the gaps of your email marketing strategy. Check out below different types of web push notification campaigns that you can implement in your online publishing house already now. By sending push notifications with relevant and interesting content, you increase chances the subscriber clicks on it and will not unsubscribe because of unimportant information you might flood him with. 💡Useful tip. To be able to send customized web push campaigns you should target it according to his behaviour pattern on your website, for example, sections or topics the subscriber is interested in. Would you agree that the person that reads finance news might not be happy if you start to spam him or her with the latest Hollywood gossips😉? 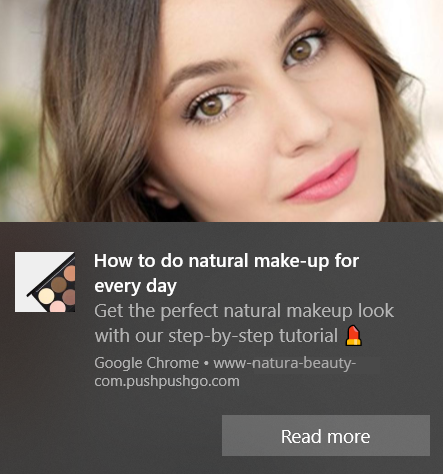 Below you can find an example of web push campaign (from the point of view of the person that is subscribed to the beauty blog that shares content about cosmetics, makeup, health and exercising). What makes this web push campaign effective? 👉 the content of the web push is the most relevant to the users’ interests (according to his footprint on the website). The content of the message is related to the topic of makeup and NOT, for instance, exercising or a new diet. It’s not a secret that Breaking News relevance is very limited in time. For every news media resource, it is vitally important to be the first source of information for its’ readers in order to save their loyalty and trust. After all, who wants to be the last one who reveals the news to their followers? 💡Useful tip. If you would like to be 100% sure that the subscriber read your message, you can admit “Require Interaction” while setting up your web push campaign. 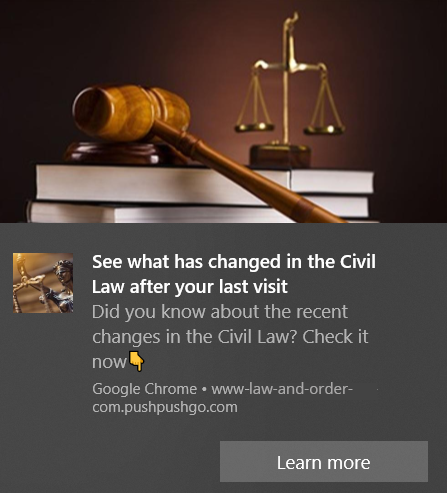 Such configuration will secure in the certainty that your message was read at the time when the browser was opened but the user wasn’t near his computer when you sent a campaign. Although this possibility is available only for Google Chrome, we can ensure web push notifications will make its’ work, as over than 85% of Internet population use Google Chrome as their main browser (Source: PushPushGo). 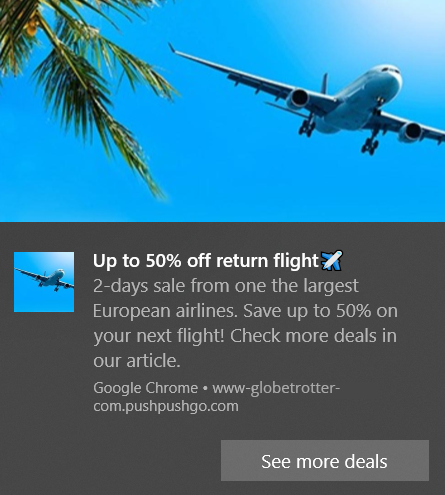 The blog that shares insights about travelling and tourism sends a notification about Big Sales made by airline company within one hour after its announcement. 👉 the cost is much lower than paid advertising while the effect is greater in comparison with a newsletter. In case if your online site publishes information that people prefer to monitor on a daily or weekly basis such as weather forecast, stock market quotes etc., web push notification will satisfy needs of your audience in the best way. In consequence, you will be able to build credibility, stay always useful for your subscribers and regularly bring them back to your website. 💡 Useful tip. Preference Center can be a great addition to this type of web push campaigns. It allows a person to subscribe only to those notifications topics of which are of the greatest interest, for example, somebody prefers to get pushes with sports news or currency rate but is not interested in a horoscope. See below how the subscription form to web push notifications with preferences looks like. 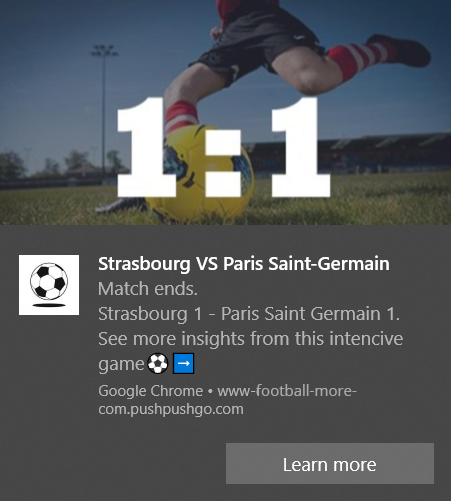 Sports information resource sends a web push campaign with a score result of the last football match. 👉 banner is customized and demonstrates the result of the game that grabs attention, especially of the football fan. 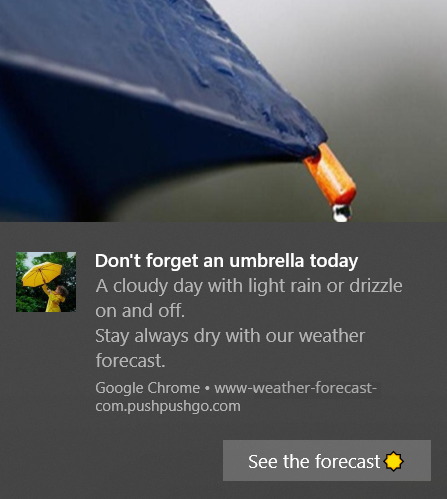 Below is presented an example of web push campaign sent by weather forecast online resource. 👉 an image that reflects the weather catches attention and increases the CTR. Sometimes it is very hard to fit in very limited space of web push message all the information you would like to share with your readers. Thus, as I mentioned at the beginning, web push notification is not a competitor for a newsletter, but it is a great addition. Combination of both of these tools can create a synergy that will straighten your marketing position and add your online media site extra points in the fight against rivals. 💡Useful tip. Do not send web push notifications about every newsletter you send to your subscribers especially if you do mass mailing every day or even few times per week. Most probably, they will find it extremely annoying. Therefore, I recommend sending web push notifications only with information that is valuable for your followers or it might directly or indirectly affect them. 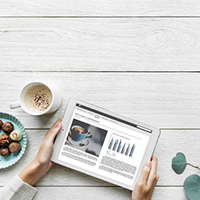 An industry blog, which the main audience is marketers and business professionals, every month sends a newsletter with unique content for its’ subscribers. 👉 one button sends the user to the main page, while other - to the featured article. At the same time, in order to see the whole list of the best articles of the month subscriber should open his or her email. This creates a situation when web push notification increases an Open Rate of your email campaign. Traffic, CTR, a number of the viewed pages, time spent on the website are, of course, important indexes to track. However, an active, engaged audience is valued even more than a number of visitors. Here, web push notifications will help you to involve users in a conversation. It’s already a well-known fact that a lot of people sometimes find comment section more interesting than the content itself. Take an experiment made by NPR in April 2014. It published an article “Why doesn’t America read anymore?” In fact, it wasn’t a real article, an author asked readers to click LIKE and DO NOT COMMENT. Ironically, but such a controversial headline created an active discussion where many hot heads claimed they actually read. This experiment once again proved that sharing own opinion as well as reading somebody’s comments is as much important for people as the text of the publication. 💡Useful tip. The more customized and targeted will be your message - the higher retention and engagement you will receive. Hence, while setting up a campaign, use appropriate tags in accordance to user’s behaviour on your site (visited pages/subpages, clicks etc). Below Web Push Notification campaign shows an example of how you can encourage people to the discussion on your website. 👉 fetching image that reflects the idea of the question. The more you know about your audience - the more accurate content you will be able to deliver. 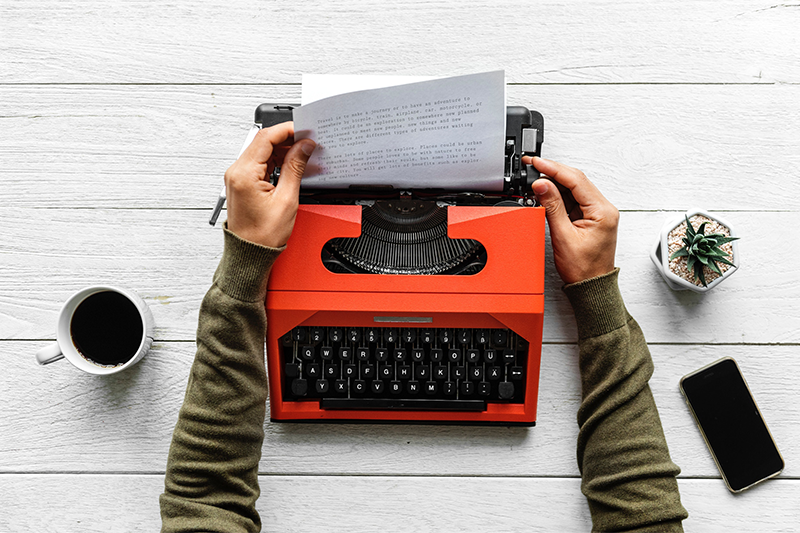 On the other hand, asking people about their feedback on an idea can make them feel more important and build trusted relationships with your readers. Robert Cialdini, a social psychologist, says that giving a value to somebody’s opinion by asking them about advice, can affect they like you more. But who said you cannot implement this rule in the communication with your subscribers via web push? 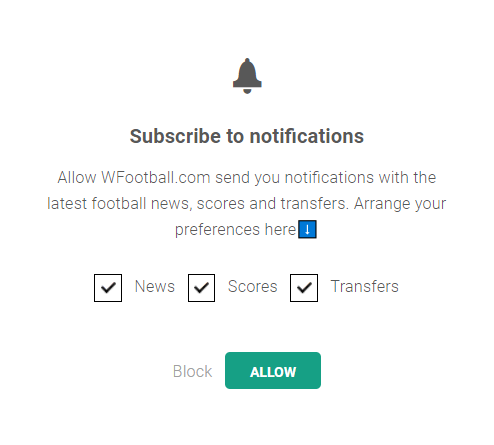 💡Useful tip: by using this type of web push notifications, you can send a subscriber to the web page with a survey or, if it is just one questions with few alternatives to choose, you can collect answers directly through the web push. 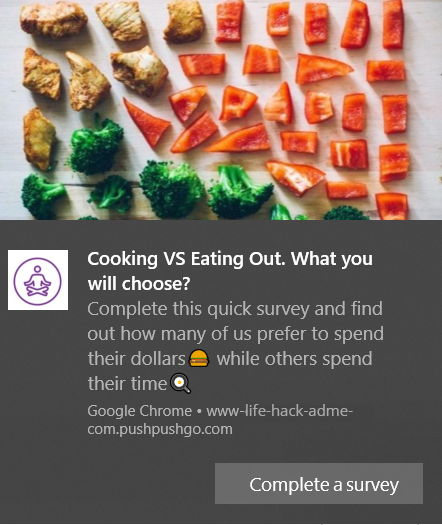 Example: Content-based website, which specification is mainly lifestyle and life hacks, prepared an online test for its’ followers that will help them to identify what the readers of the blog prefer: cooking at home or eating out in the restaurant. 👉 the message also contains information that can play a role of the award, namely a possibility to see what other subscribers answered. From a psychological point of view, it can stimulate humans’ curiosity and encourage them to action. 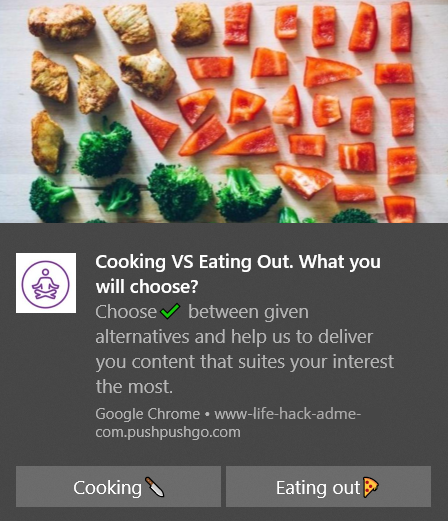 👉 each button links to the page with a selection of articles according to the chosen topic: Cooking or Eating Out. According to Blogging Wizard around 75% of blog visitors will never return back to the website. Although the number is quite disappointing, web push notifications can help to improve such results. 💡Useful tip. Usually, publishers are busy with a lot of running tasks, therefore in order to save the time, it is possible to set up an automated web push campaign that will be sent to each subscriber that didn’t visit your site for a while (this period can be configured according to your requirements). Example: An information resource that publishes articles and news about law sent a web push campaign to its’ subscribers that didn’t visit their blog within the last 30 days. 👉 the campaign targets those who were reading content about Civil Law. It is a highly relevant topic for the subscriber. And, consequently, it will affect higher CTR. People like to receive something for free. That’s why sending a web push notification with information about a free downloadable piece of content can be highly effective. 💡Useful tip. Collect leads by automating such campaign, for example, web push notification with a proposition to get a checklist might be sent to the subscriber after 60 seconds he entered the website. You can set up the delay time of this automation scenario up to your needs. 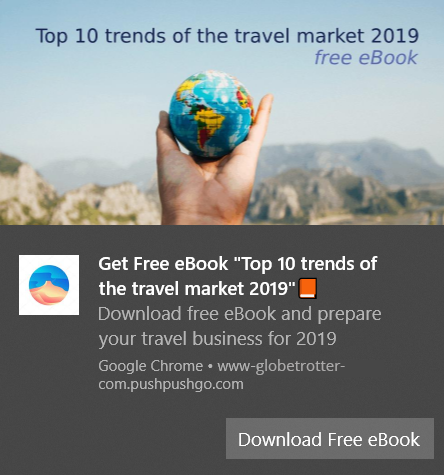 Example: Travel blog sends an automated web push campaign for those who just entered the website with an offer to download the free ebook. 👉 helps to collect leads: in order to download an eBook, the person should leave his or her email address. It is not a secret that the main source of income for media or blog businesses is an advertisement. Therefore, to prosper in the era of digital technologies, publishers are forced to think outside the box, especially when 11% of global Internet population use ad blocking filters which is more than 600 million devices. In such realities, web push notifications could become this innovative solution. 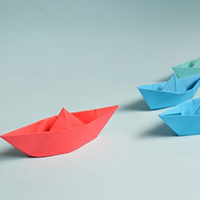 It is still a fresh concept that could bring early-adopters to leading edge positions. 💡Useful tip. After building a database, you can consider selling space for advertisers. The audience is highly targeted. Hence, the efficiency of such campaigns is huge as well as the received number of authentic interactions. However, it’s advisable to plan everything carefully, choose only relevant brands and do not send notifications with advertisement too often - nobody likes spammers. 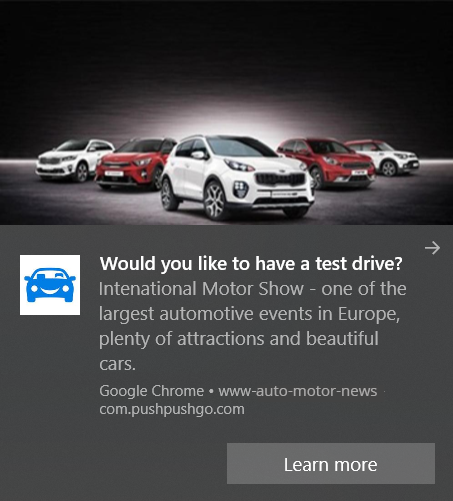 Example: online media resource that regularly creates blog posts about news in the global automotive industry sent a web push notification with an advertisement of the International Motor Show. 👉 catchy headline and image will definitely attract users’ attention and increase CTR. If your online magazine uses paywall method, web push notifications can help to boost the number of paid subscriptions. 💡Useful tip. Use web push notifications to send promo-codes to encourage a user to subscribe to the paid content. Look at ecommerce! The industry successfully implemented this scenario with an average CTR about 21% (Source: PushPushGo). 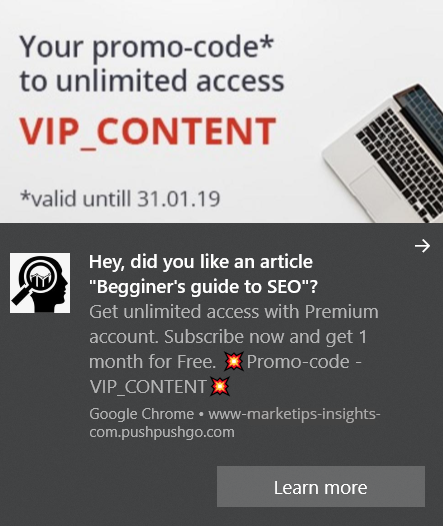 Example: A marketing blog offers a promo-code for its subscribers that gives 1 month of unlimited access to the VIP articles. 👉 an offer is limited in time. As a result, urgency can force the receiver to validate the code until it expires. 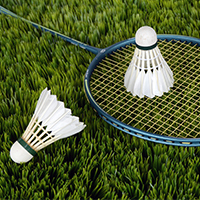 target only the right audience and send customized messages according to users’ behaviour on your site. Web push notifications open the whole range of new opportunities for the web publishing industry. They are just gaining in popularity, so it’s important to jump on the bandwagon to get all the benefits these technologies offer. If you did not use web push technologies before, it is a high time to make the first step and to experiment with it. Did you know that the most successful businesses have built a test-for-results culture, where experimentation is an integral part of their marketing budget? Start testing web push notification app, collect subscribers and send your campaigns during 14-days absolutely for free. No credit card required, no extra payment. Passionate about advertising, digital technologies and marketing itself. Life motto: "Growth starts out of the comfort zone". 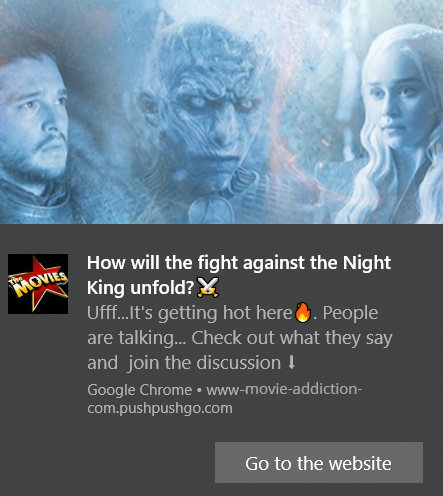 Web push notifications + content marketing: could it go well?